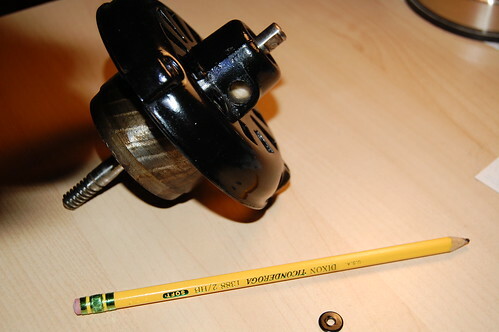 The small round washer acts as a plug to keep the wool wick inside the bearing, and the hole is where you add oil. 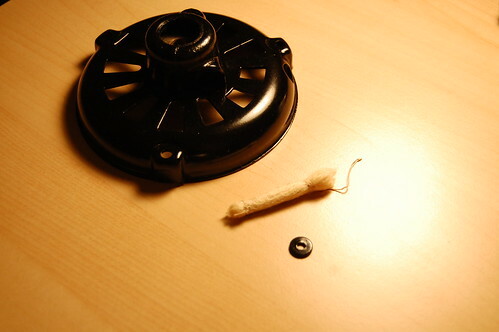 The wick itself is made of several strands of worsted wool yarn that have been tied with string. Originally this was a black lump of grease when I first pulled it out of the bearing, but I was able to clean it up by soaking it in laundry detergent. 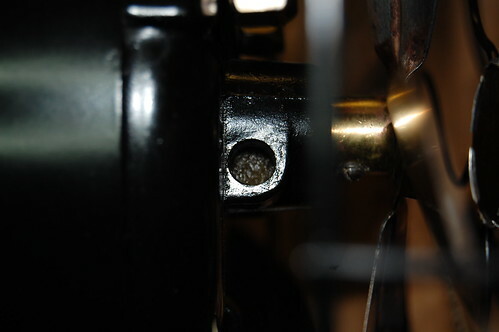 A greasy oil wick prevents it from working, and my Wagner’s front bearing was bone dry when I first took it apart. If you’re doing a restoration and you need to replace the wick, you must use real wool. Synthetic fibers apparently do not have same degree of capillary action. Wool wicking is also the material of choice for steam locomotive bearings. 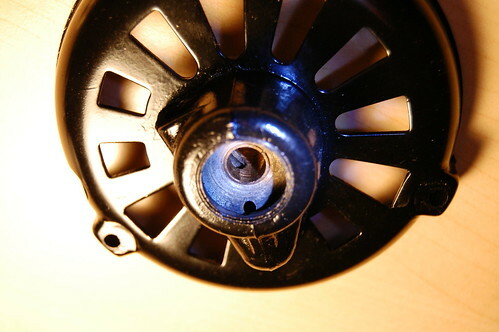 The wick fits in the hole on the top of the bearing. Here is a photo showing the assembled bearing (minus the washer). Add oil about 10 drops at a time and allow it to soak in for an hour. Do this again until the part of the wick you can see is saturated. If you add too much oil then it could spill out of the top, so you don’t want to add more oil than the wick can hold. 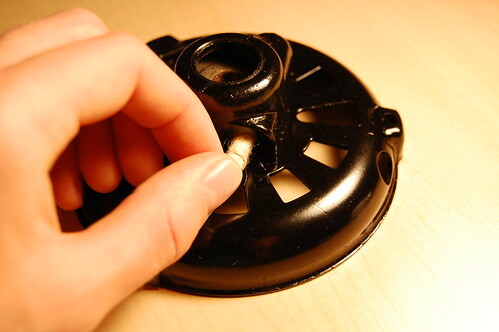 It’s important to make sure the wick never goes dry so that your bearing will always be properly oiled.